Origin: Burma (Myanmar), Shan culture. Materials: Steel, iron, silver, copper, brass, wood. 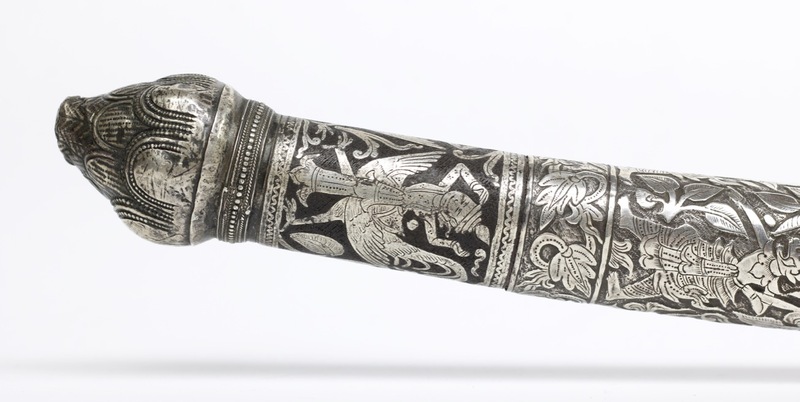 A magnificent Burmese dha-lwe with spectacular inlaid blade. It has a slightly concave panel in the center that is cross-hatched and blackened. 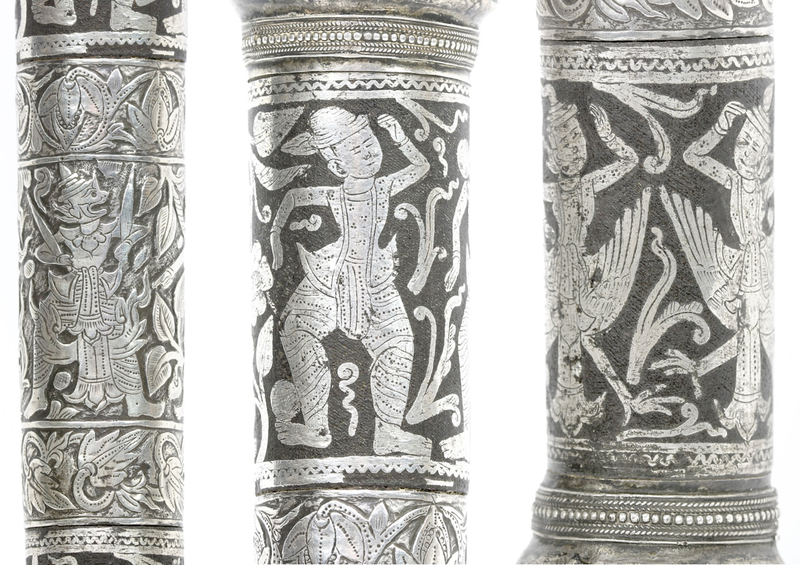 It has overlays of typical Burmese vegetal motifs alternated with animals, actual and mythical. What is remarkable about this blade is the quality of the work, and the fact that it is executed in three metals: brass, copper, and silver. Most of these high quality dha have decor only in silver, this is the only one I've come across like this. The long backedge is similarly crosshatched and blackened, with geometric decor in silver wire overlay. A similar pattern is repeated on the base of the spine of the blade. All overlay is done with considerable precision and skill. The blade is thick, stiff, and with good balance. It's not just a ceremonial showpiece, but capable of good cutting. The handle consists of two iron sections with silver overlay, and in the center a section that is probably made of wood overlaid in silver worked in repoussé. The handle terminates into an artichoke shaped silver pommel. The use of iron for a handle on these is highly unusual. Within the maw-pan are several creatures. Each side of the blade shows four birds of various species, two salamanders or lizards, and a taman chah literally "forest tiger". Also translated as "were-tiger" because much like the werewolf in European folklore, these taman chah are the animal form of a human who can shape-shift between tiger and human form. 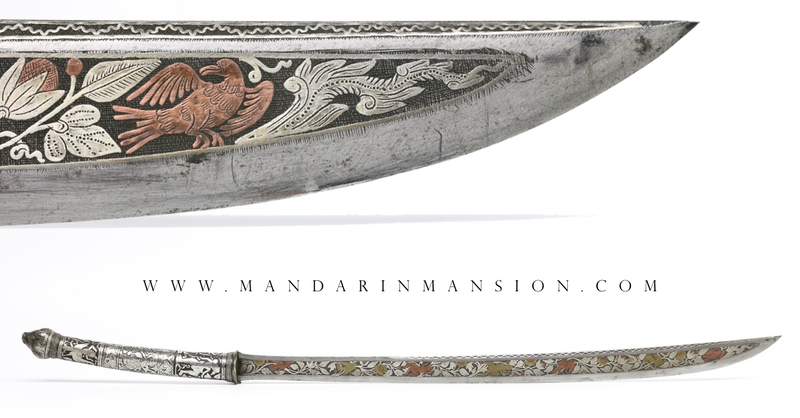 A wonderful example of a Burmese dha with fine multi-color overlays on the blade, and iron handle sections. It's the only one of its type I've ever seen. Despite the decor it's well-balanced, with a thick blade of good steel. It was clearly made for someone of very high rank and status who wanted a pretty but real sword. 1. Sylvia Fraser-Lu, Burmese crafts, past and present , Oxford University Press, 1994. Page 239.